Once again, it is time for our weekly news round-up, where we put the most interesting stores from the past seven days for anyone who needs to catch up. We'll start with a bit of news that you shouldn't have missed if you're excited about the upcoming Samsung Galaxy S6 and Galaxy S6 edge smartphones – both can now be pre-ordered, with shipments expected to begin before mid-April. If you consider yourself an LG fanboy, however, then you're probably curious about the latest leaks surrounding the company's next top phone. We happen to have an image supposedly showing what the handset in question may look like. Images of the rumored OnePlus Two haven't leaked yet, but we do have a list of alleged specs and features, along with a possible release date (hint: the launch might be scheduled for later this year). More of last week's read-worthy stories can be found in the slideshow below! Is this the LG G4 photographed in the wild? Pre-orders for Samsung's latest flagship smartphones are now live. The Galaxy S6 and Galaxy S6 edge can be pre-ordered from your major carrier of choice, and you should get yours on or around April 10. Not sure which one to get? Then go to a brick-and-mortar store to check out the phones yourself. Both should now be on display at carrier outlets and major retail partners' stores. Speaking of the Galaxy S6, here's a video of a unit being taken apart. It looks like the unit is repairable, but the process is more difficult than before. The reason – Samsung's choice to go with a sealed, glass-and-metal body for the phone. We had seen renders believed to be of the LG G4, but not real-world photos of early units until last week. While the leak's authenticity can't be confirmed, this is believed to be the LG G4 – the successor to the LG G3 – or a variant of it. Furthermore, rumors specify this device to be a mid-range model featuring a stylus and not LG's next flagship. For a while now, we've been hearing rumors about an upcoming HTC smartphone referred to as the One M9 Plus. Here's one of the latest leaked images exposing the device, but there's more at the link below. 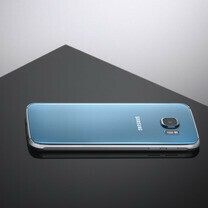 The phone is expected to be announced on April 8 at an official press event. That's when we'll know if the phone will indeed pack a 5.2-inch display, a QHD screen, and a fingerprint scanner, as rumored. To innovate in today's smartphone market is quite a challenge, but Samsung thinks it's got what it takes to wow us soon. It is quite possible to see foldable phones by Samsung as early as next year, and we know that the company has been developing prototypes of such devices for a while. Furthermore, Samsung is seeing potential in iris scanners built into mobile devices. These are to be used as a more secure alternative to fingerprint scanners. And now, here's news coming straight from the far east. Xiaomi, known for its reasonably-priced Android smartphones, is hosting an event on its fifth birthday. The event is scheduled for March 31, and we can only guess what's going to be announced there. It could be a smartphone, if our intuition is not mistaken. This smartphone exposes a bezel-less smartphone by Oppo, and no, it's probably not just a concept that's never launching. Details about the handset are scarce, unfortunately, but we do know how the effect of seeing no bezels at the phone's sides has been achieved. Long story short, it's all smoke and mirrors. And lastly, ZTE announced a couple of new phones under its Nubia lineup. The ZTE Nubia Z9 Max is a 5.5" 1080p handset with Snapdragon 810 chipset, 3 GB DDR4 memory while the Z9 mini takes it down a notch with a 5" 1080p screen and Snapdragon 615 chipset. Having played with a Galaxy S6 on hand at Best Buy, it's comfortable, sturdy and feels more light and premium than the vast majority of smartphones on the market, for sure. Not sure how or why but I ordered from TMO my S6 Edge 128 and it came today. Has already completed a system update. Since also have an IPhone 6 the new Samsung fingerprint reader a big lus. Still downloading apps but more later.